How will your retirement look like? Have you thought about anything on retirement planning ? This is something, which you should spend some time on. Our parents and grand-parents might not have given much importance to their retirement, they might have just took it as it came to them, but can we also afford to do the same with our retirement? Would you like your retirement to take shape just like your parents? Lets discuss it and take some food for thought from this article today. This is the 3rd and last article in the series called “Financial Planning and Social changes in India” . You can read other two parts here and here . In our country, where a very small number (less than 10% of the workforce which is in the organised sector) has access to some social security like provident funds, but the rest – almost 90% of the workforce – has no social security, Retirement Planning is a major issue . If you take care of your retirement planning, your future will probably be much better and in control than without doing anything. It has become extremely important to plan for one’s retirement and at least take a step towards it. I will list down some pointers which shows why retirement in future India will be much bigger and serious issue. Look at all the points in totality and you will realize that planning for own’s retirement is not just an option but a necessity these days. One of the major problem while doing retirement planning is to assume how long the retirement will last. This has a direct relation with life expectancy. As a country develops, its healthcare and overall life style level improves and life expectancy increases. You can see the life expectancy in India is moving up and up with each passing decade . It was 49 yrs in year 1970 , increased to 64 yrs today in 2011 and is set to increase upto 73-76 yrs in 2040-50 (projections) . Now this life expectancy of 76 yrs does not mean that everyone will die at age 76 , it’s an average . If you personally have a better life style , better health and better medicare access compared to a average Indian, chances are you will have a much more life expectancy which will cross 85-90 yrs . Leave future, even today you can see more and more people living upto an age of 80-85 . So, you can safely assume that you will have to accumulate enough money which can last atleast 30-35 yrs after your retirement, else make sure you die with your money itself 🙂 . Dependency ratio means the ratio of Old age population vs Young population. To calculate it, just take total population above Age 60 and divide it with population between 15 yrs – 60 yrs and you will get Dependency Ratio. You will be surprised to know that right now in 2011 , the dependency ratio is around 5% in India, but in year 2050 this ratio will rise to 15% , which shows you that more and more people are going to be in the old age group compared to young population . See the chart below . This is not a small issue. More and more people will be shifting to this “retired” category in coming decades with more load on the working population. At this current moment, we are one of the youngest country today with as high as 50% population below 25 yrs of age , but will this continue forever? With more population control measures at government and public level, these numbers are going to be different in future. Hence the conclusion is “More and more people will come into retired category as percentage of population in coming future”. If it was 1970 , you could have safely assumed that you will be probably spending your retirement with your grown up kids , playing with your grand children, but is it happening anymore in these changing times? More and more people are moving in different parts of country in search of education, jobs and settling there compared to old times. Parents on the other hand dont choose to move most of the times as they feel connected to the same place where they have spend all their life and more than that , they have their social groups at those native places. Very rarely I have seen that parents leave those places where they have spent 30-50 yrs of their life . Bigger opportunities in life and a complex life style has resulted in smaller family size and its going down each decade. As per research reports of National Family Health Survey , Ministry of Health and Family Welfare (MOHFW), Government of India , average household size in the year 1992 was 5.7, which means each family had 5.7 members, this came down to 5.4 in 1998 and as per last reports of 2007 , average family size is 4.8. Now imagine this, each family having approx 4.8 members , that’s today ! . Will it shrink further to 4.0 in coming decades , what do you think ? I think if it does not go down , it will definitely not go up ! . Thats my personal opinion . This clearly shows that families size are shrinking on average. More and more parents these days are living in their home town where they raised their kids , but kids have moved to other places and settled elsewhere. By no means I am saying that not living together has resulted in less love or less harmony , NO ! All I want to say is people are living separately and “expecting” to live separately now a days. This will only rise , and not come down by the time you retire. Now leave all the factors we talked above. Lets look at how people today feel about their retirement in coming years. 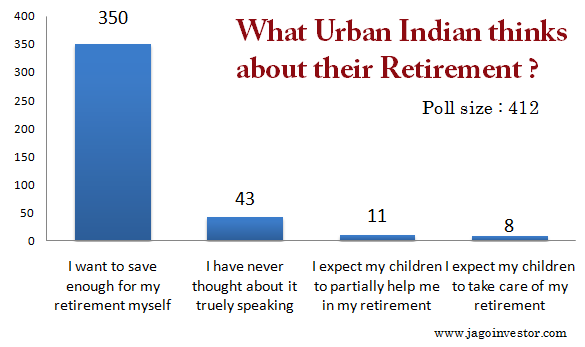 I ran a poll on this topic which was taken by as high as 412 unique participants and you will be amazed to hear that as high as 83% said that they would like to be self-dependent and want to save all the money they would require in their retirement. Around 10% said that this is the first time they are having any thoughts about their retirement after seeing the poll and just 7% people expect to be fully or partially dependent on their children for their retirement. Which shows us that as high as 93% readers on this blog who participated in the poll want to be self dependent and plan their retirement themselves. Look at the poll results below . Best Investment for your Retirement ? So whats the best Investment you can do today which will make sure you live happily in retirement? If you thought that it’s some financial product or a strategy to make some extra bucks, you are wrong ! I am talking about your Health here. Note that reaching destination is important, but after reaching the destination if you don’t feel joy and happiness and are not able to enjoy the fruits later, all the hard work you will put for reaching for destination will go waste. You will be living for 25-30 yrs minimum in your retirement, Now if you have all the money , but no proper health at the end, you will not be able to eat what you want, you will not be able to roam around places , you will not be able to enjoy each moment of your life , what’s the use of all your hard-earned money in that case ? I would say all your efforts will be waste. This is one serious point I want you to take home today. Think about it. People who are neglecting their health and financial life today are living in illusion that future has a lot for them. Start working on your health today, do a daily SIP investment in your health through exercising in gym or working out in park or at least jogging. lumpsum investments in health does not work , It can only work in your financial life. I want you to download this e-book called Food and Thought right now. What do you think about retirement after 30-40 yrs ? I want to hear your action plan for your retirement in comments section. Do you think the points made for Retirement Planning by me makes sense ? Write us your opinion in the comment section. A very well written article. What you say is very much correct. I will retire within the next three years. I will live alone during retirement as I have two daughters who will live outside India. My wife has passed away. I own my house in Pune and have many friends there. I have lived outside India for 21 years in Jakarta. I will return to Pune after retirement and live in my house. It is certainly difficult to estimate how much money you need during retirement. If I follow my habits of exercising daily and not eating in restaurants, I hope to be in good health till age of 75 . The cost of medical treatment will certainly go up in future. I have saved good amount of money and also have bought real estate around Pune in form of land. I will sell the land if my money starts to run thin. I am planning to live on long term capital gains which are not taxed at present. For the benefit of our readers and very young populations, would you like to contribute a written piece on “How life looks like around retirement in India” . If you can take out some time to write his for us, it would be great ! These are just the basic five steps to get a proper retirement benefit. The best solution is to ask for an investment planner to help you guide through post retirement investment plans. There are investment agencies like ‘Right Horizons’ which provide proper guidance to their clients so that they can live a tension free life post retirement. VPF or PPF?…..this info will be helpful too…. That’s fine, but should you invest in VPF if you are already investing in another popular scheme — public provident fund? You have quite a few reasons why you should prefer VPF over PPF or at least in addition to PPF. For one, whether you want the tax benefit or not, you cannot invest over Rs 1 lakh in PPF. In case of VPF, you can invest well over the Section 80C ceiling. Two, you may not be a disciplined investor in PPF. Also, you will have to take the trouble to deposit the amount in your bank or post office. In case of VPF, your employer will do this for you. Three, interest rates on PPF, in recent years, have been lower than rates notified in EPF. Also, private-trust run EPFs may even manage a far higher rate. Four, the clause to avail a loan based on your PPF is more restrictive compared to your EPF. Five, if you want to call it a day at your office, you can withdraw the entire sum (not taxable if you have worked for over five years). PPF is locked in for 15 years and allows only partial withdrawal. This said, the biggest limitation with VPF is that it is available only to salaried individuals. Besides, most employers do not allow you to alter your contribution mid-year. You may reduce or increase it annually. i had already thought of health after retirement before reading this artical. But what i did was that i decided to live & enjoy life as much as possible in present days. so when i was planning to buy a new car, i often thought that why should i buy a car in this young age when my father never bought a two wheel. so there comes this thought that one should enjoy life when his body is functioning properly. so i bought a new car. more over in my company (Power Grid corporation) we have a post medical scheme for self & spouse. so no need to bother about medical expense after retirement. so i wisely started contributing to my VPF account an amount of Rs. 5000 extra apart from my provident fund. “the richest person in the world is one whoes fives senses are working properly” came the Answer. I think though you very well mention that SIPs can pave a good way towards retirement, however, one of the best sources of diversifying retirement funds is using the best debt options – Provident Fund. People tend to contribute in it year on year, without realising how it works and its importance. I want to invest Rs. 10 lacs. I have horizon of 1 year and my age is 60. The money I got as my retirement benefits. Need regular income. All you are here very knowledgeable , Retirement planning is the most important part of us when we do investment , but as the time pass we busy in life with more liabilities and short term goals became more focused , we start to ignore that . I had done investment in Sip , PPF , NPS , Gold for my Retirement purpose . Gold as safe gaurd and to full fill requirement at old age to give gift to my daughet in law or daughter or to my grand son . As my earning will increase , my standard of living also increases , so with the time , the amount will increases to different instruments . Retirement planning to be done in correct way might need exerptise , but i think if we start investing , in Mutual fund through Sip , that will automatically cover lot of Target corpus. The ebook which you have shared at the end of the article is really an eye opener. There are so many basics facts mentioned in that book which we all know but have really forgotten. Thank you so much for sharing such an informative book. Manish, I straight away agree with you, increasing the SIP amt will be little manual when done yoy. My thoughts are simple. I see SIP serves us in two ways. 2. Its takes advantage of mkt volatility. Now mkt ll continue to fluctuate. Anyways i wont regret even if mkts are going up….however if mkts dip that little bit of increas in SIP will work great is n’t it?…..I feel things does not come easy….If the fund manager is taking 99% headache on managing the fund our head ache it just be patient and continue investing. Which all the SIP investors mostly do…what am i doing extra…Increase SIP amt every year 🙂 Its not easy, it needs conviction….so no pain no gain. Yes Manish. It would beat SIP. This technique is called Value Averaging Plan and has advantages over conventional SIP. One invests more when the market is down i.e. cheap. But the question is it proved that in general it always beats SIP ? or it it only in few secenarios .. I am quite apprehensive that VIP is always better than SIP ! . Also if thats the case, then why are all companies still on SIP , why are they not coming with VIP facility in mutual funds ! Theoretically, VIP should outperform. Will see if I can work out some numbers to support the same. Retail investors might not be able to appreciate the complexity, may be that’s why companies haven’t launched them. I feel MFs especially thru SIP are good tools to accumulate retirement corpus. Which is now known universally. However i believe we have to increase the SIP amount by some % every year. This very site have a SIP calculator 1. Constan SIP calc and 2. Increasing SIP Calc. the latter will be something we all have to think about increasing SIP amount by some % every year. If some have not tried it i am sure it will make your eye brows raised!!! Yes you are right , the only think is its little manual work to increase it every year by a fixed percentage , it looks good at paper . the practical situation is to increase your SIP whenever you start having a suplus , so some one who is doing a SIP of 10k can continue for some years and then directly increase it to 15k after 2-3 yrs . What do you feel about it ? Hi Manish, Wonderful post and the message is strongly conveyed!!! All our readers have discussed about finincial products and insurance covers…Health cover is a corrective measure to fix ill health, none of us want to fall sick just because we have insurance…Health cover is to cover unforeseen health problems however we can prevent many of them just by taking some preventive steps. 1. I ve already started to cycle to my office on alternate days( This was little tough initially but i pushed myself not i am fine) For others some thing else may work well…Say a morning jog, swim, take up their favourite sport. 2. In addition to my company provided Health Cover, i am planning to take up additional cover on my own. Covering dependends makes more sense here. It will be intresting to see what preventive measures our readers have taken which works well for them. Yea .. regarding Gym think i think you are in a better position , you atleast took action and started implementing , many dont even have it even in their wildest thoughts . Cycling to office is something really cool especially if your way to office is peaceful and not so trafficy . Ideally it should be between 10-15% Depending upon time horizon and Risk profile of the individuals. Agreed with Bharat, regarding inclusion of Gold and silver in one’s portfolio. Euro zone – especially Greece, Ireland and Spain continued to experience burgeoning debt crisis. The U.S. economy too for the major part of the year suffered the pain of high unemployment rate, low economic growth rate and low consumer confidence; which eventually led to stimulus package being announced in the form of QEII, in an attempt to revive their (U.S.) economy. In India the political uncertainty caused due to several scams last year also led to the precious yellow metal becoming bolder (rose by 23%). Moreover, gold merchants also maintained elevated stock levels, as physical demand also remained robust due to several auspicious muhuraths during the year. So it makes more sense to put your money in Golf and Silver, for long term, which should help you in achieving your retirement Goals. What percentage of portfolio can be allocated to gold + silver ? The price of gold may hit USD 5,000 per ounce (Rs 74000/10 gram), nearly three times current levels, in three to four years, as demand from sovereign states, central banks and exchange-traded funds (ETFs) rises, the chairman of two Canadian gold mining companies said. “Gold is used as insurance for bad governments,” Rob McEwen, chairman and chief executive of Minera Andes Inc and US Gold Corp, told Reuters on the sidelines of the Mines and Money conference in Hong Kong on Wednesday. Gold is traditionally used as a hedging tool against inflation and economic uncertainty. The yellow metal has also been a favourite investor hedge against loose monetary policies in the wake of the global financial crisis. McEwen said gold was in the middle of a super cycle that could end by 2015, adding that the length of the gold super cycle and the USD 5,000 forecast were based on historical gold prices and the ratio of the Dow stock index against gold since 1970. McEwen founded Canada’s top gold miner Goldcorp Inc. He left the company in 2005, cashing in for a little over USD 200 million. He said about 90% of his personal assets were in physical gold, adding the he owned a 31% stake in Minera and a 20% stake in US Gold, both headquartered in Toronto. US Gold mines gold and silver in the United States and Mexico. Minera has a project in Argentina. McEwen said he believed that countries such as China, Russia and India would buy gold as part of their foreign exchange reserves. If China wanted the yuan to become an international reserve currency, the government may need to put 10% of its foreign exchange reserves in gold, he said. The world’s second-biggest economy, China holds less than 2% of its 2.85 trillion foreign exchange reserves in gold, which have stayed at 33.89 million ounces since April 2009 according to official figures. He said, however, that global gold production would continue to be limited by high costs and tighter regulatory controls. Spot gold was steady at about USD 1,427 per ounce at 0630 GMT on Wednesday, within striking distance of its record USD 1,444.40 per ounce set on March 7. Nick Holland, chief executive of the world’s fourth-largest listed gold miner Gold Fields Ltd, said on Tuesday that the gold could hit USD 1,500 and the industry was not making a huge amount of money at current prices. I am assuming most of your readers are very young and are working in IT / Finance industries. I am 45 and I work as a IT Manager and retirement planning is very close to my heart. 1. Do you think your industry will continue to grow at the current high rate in the next 25-30 years of your work life ? 2. Do you think they will be able to promote you in the same rate they have been doing your seniors. Consider this, a fresher who joins a big IT company today has got at least 1 Lac senior people in his organisation. Will he become even a Project Manager. Same question for the new trainee joining a ICICI Bank or HDFC Bank or Insurance Company. Do you think all of the Trainees in these industries will even be able to become Mid level Managers. My predictions is no. Please note I am not suggesting none of these people will be promoted. What I am saying is it will become tougher and the most important thing is there will be shakeout and many of the senior people will be shown the door. 3. Thus if you are 25-35 year old working in these kind of high growth industry you may target to attain financial freedom by 50 as I foresee many of us will lose our high paying job by age 50 as the companies will try to replace older high cost employees with younger cheaper employees or better still Indian Companies will outsource some of these jobs to even countries like Bangladesh , Nepal etc. 4. How many of us are upgrading our skills to keep pace with the market. How many of us think that we can join a new industry at mid level position. Yes, we all know that in the last 2 years most comapnies have used the recession to reduce the salary hikes. Specially for senior people where attrition is very low they are giving very little rise. Also, in my organisation I have seen that in the lst 5 years frehser salary has remained almost constant thus in real tersm the fresher salary has actually reduced. Very Nice and Thought Provocating article. Thanks . keep reading ! I love the conclusion Manish!You are apt in saying that with out proper health, even we live longer, there is little use. As said people will loose their health in earning money and then loose their most beloved money to earn/ restore their health. Recently I came to know about your blog through Google Search and it has become habbit to visit on alternate day to find new interesting article. I have been reading a quite on Retirement Planning. Today I gained more knowledge through this article. I have kept aside 10k/month Mutual funds SIP for my retirement. Thats great to know , I suppose 10k per month should be a great amount to invest considering you have enough time in your hand 🙂 . So when can I c ome for some consultatin doctor 🙂 ? And by the way , there is a new book in the market called “Wealth Prescription for Doctors” By PV Subramanyam , you need to read it ! I have a tip for those persons who are not in organised sector and want to take a Medical Insurance. Bank of India in collaboration with National Insurance Corporation offers cheapest Mediclaim policy. Since they get group insurance benefits, their premiums are half of what you will pay when you go individually. NIC is Govt. Insurance company and hence I think they will be reasonable in settling claims. Please check with your local branch of BOI. Yeah will eagerly wait for it :). I will be needing one soon. but it wont come very soon , Let it come to you as surprise ! Check out the following website everything is given including proposal forms. Please remember that Health Insurance is operated by criminal middlemen. I don’t know how much commission they get but most of them are working in these Insurance Companies and running broking business in the name of their relatives. If you approach them they will suggest to you only expensive plans. When my friend went on shopping spree for Medical Insurance and was about to get trapped by one of these employees, lucklily he was saved by another Junior Employee who (probably had tiff with his boss) and he told him to go to Bank of India. Thanks for that info , can you give some resource on this or it is based on your personal experience ? You will not get any published resources on this. When you hear personal stories the realities come to fore. That is why personal information is much more important. This is true for any financial product in any part of the World. There are much bigger criminals in US and Developed market. I don’t mind paying decent brokerage but not for brokers who have their personal interest than the interest of their clients. Ok , I agree with you now . there is also one group health insurance for the account holders( with payment of premium) of Indian Bank named ‘arogyaraksha’ from united india insurance co. ltd. it covers 6 persons including self,spouse, 2 children and parents , and si could be upto 5 lacs. Food and Thought book is very nice and meaningful. It is a very good gift for the entire world. YOU ARE A GIFT FOR ALL INDIANS..Keep going.. The article should be like popup message appearing in front of the people so as not to loose the focus on important thing. There is no word as retirement in my dictionary. I plan to get involve in social activities which will keep me busy w/o financial gain. Yes there should be sufficient corpus available to take care of your family health. We have decided Equity MF and PPF as the avenues for the same. Currently Equity MF contribution is higher than PPF. It will be reversed as we approach “No work- All Play” scenario. Brilliant Article! This is the best retirement planning advise I have read! Will be back on track soon. Great to know that it has motivated you to take steps in your health life 🙂 . Keep reading . GREAT LINE. Really a very important aspect along with your financial planning !! Thanks a lot 🙂 . I wrote that line as it came to my mind 🙂 . On the topic of retirement, here’s a thought-provoking blog that I read: http://earlyretirementextreme.com/. Would like to hear your thoughts on this approach. Is there any specific article you want me to look at ? 4. What do want to do after we retire? We just cannot sit around (at least mos of us.)? What hobbies/interest can we pursue now so that it can not only keep us engaged (by time) but also may be help us earn some money. 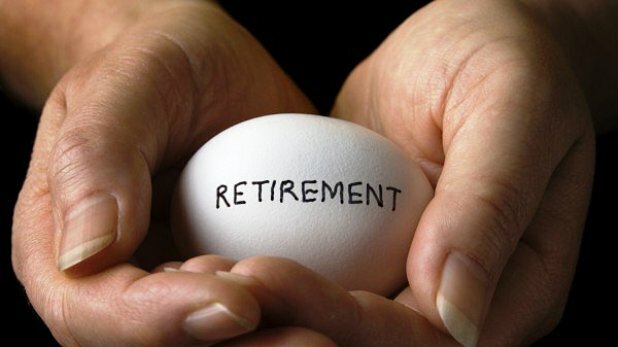 Retirement planning should be emphasized by Government. Products catering to retirment should be given maximum incentives. I see NPS (New Pension Scheme) is headed in the right way. More such products should be brought to the publics notices. Even now, not many know about NPS. It’s a sad state. Is there any other exclusive retirement products other than NPS ? Please let us know how we can choose our retirement products. Thanks again for all the great articles. NPS is there , but it still lacks in clarity and much needs to be done to make NPS a more lucerative option . The best is to buy anyhow a House and after 30 years or so keep it on Reversse mortgage like in America people are doing, after all we r copying the western model (This is the best Retirement Planning its called KISS i,e. Keep it Simple Stupid). Rather then investing with available amount pay it for the EMI of the house/flat you get tax benefits also 😉 . And lesser tension of volatlilty in Markets & Interest rates and all that. K I SS (This Keep It Simple Stupid ) Strategy. It was my advice, to follow is yours. !!!!!!!! Reverse Mortgage is definitely a fallback if the funds are not going to last the couples lifetime. It’s a risky proposition if rev-Mortgage is the only means to fund ones retirement. The regular payout’s may not be sufficient to support the living and health costs. Rev-Mortgage works best if taken in the second half of the retirement period or later. Ones best bet is to plan retirement the regular way and use home equity only if things don’t work out as planned. Remember there are several restrictions on Rev Mortgage. The most important is that this money is to be used for living/health expenses only and cannot be used to run or support a business activity or similar venture. The Max tenure is 15-20 years and at the sole desertion of the bank. The house should not be too old or located in a apartment complex where the other houses are not well maintained. Although the residual life of the house has to be atleast 20-25 years, the bank will be very stingy when disbursing loans on a house located in a poorly maintained apartment complex, after-all the bank has to be able to recover the loan by selling it to another buyer after 20-25 years. Currently the total value of loan disbursed is capped at around 1 crore (interest included), this will definitely increase in future, but will depend on the banks confidence and outlook on real estate. That said, 1 crore may not alone be sufficient to support lifestyle of a person living in a apartment worth 1+ crore! The bank will not finance the entire home equity, it will maintain a margin of safety of at-least 15-30%, depending on the location. This along with the 1 crore cap can upset some calculations. So it is better to keep rev-mortgage as plan B or C. A couple whose Plan A is rev-mortgage will have no fall-back in case additional funds are required for whatever reasons, unless their retirement period is going to be 10-12 years max! I agree . Reverse Mortgage can be part of “Retirment plan” . It can be the “retirement plan” . Also we dont have much clarity on how it will take a shape in future at large scale just like NPS . Yes, why not , a Rs. 60 lac flat/house at 15 % Compounding after 30 years will be Rs. 39,72,70,632 (Calculated on your Future Value Calculator – One Time) . I had taken 15 % CAGR has it been in last 30 years. Does any other financial instrument gives that amount with so much safety !!! Then why taking all this tension of SIP / MF / PPF / ULIP / FD / (FP’s) etc…..
And then keeping it on Reverse mortgage @ 8 % will fetch so much of money for next 25-30 years, that your Retirement age will very easy to live. NOTE : No son will take care of their parents after 30 years that my guts call looking at current sceneriao. We can only project some kind of future returns in any asset class if we have some historical data to analyse or some strong research, as in equity . 15% in real estate for 30 yrs looks too much to me . 10% is a good estimate as per my understanding goes . Why do you feel real estate can move by 15% year on year ?Any strong reasons ? India grows at 7.5 to 8.5 % then the Real GDP is 15 % or so which means Salary growth @ 15 % and same had the effect on Land / Plots / Flats where people Live / Work . Real Estate had the real effect of GDP growth when calculated on long term scenario. Compare it for last 30 years and you will see it. If you have the Data for Real GDP growth it will arrive the figure of 15 % CAGR on Real Estate prices. Let be all that anlaysis even if it grows at 12 % then also its Rs. 18 Crores after 30 years, that much CAGR we can expect now. Now what you say even if one get 75 % Mortgage benefit on that amount what you say. It comes to Rs. 13.5 Crores. Calculate now how much amount one should require to build that corpus with same amount of safety that Real Estate provide, which is less volatile and risky then Equity Class. It come to 38000/- PM for 30 years, can one do that with SIP of Equity. If one purchase after paying down payment for Rs.60 Lacs home value then EMI figure will come around that. For a very long period using the calculator to project the future is risky. You have to consider many factors including the maturity of the markets. We started 30 years back with a low base and thus we could achieve so much. Now that we have attained a base it will be harder to keep growing at this high rate for a very long time. For argument sake if we think that Vinay’s house will be valued at 18 Crore in 30 years For him to sell this house he will need a buyer who will pay this amount. Consider the people who are buying a 60 L apartment today. They must have a annual salary of at least 12-15 Lacs.which is 4-5 times of annual salary. This means to buy the 18 Crore house the future buyer will need 3-4 Crore salary. How many people will get that salary? .Just consider what it will mean in USD a salary of 700000 to 800000 and you will get the answer. Yes , I agree with you , but i have two points . 1. One way if to not project future with just one single parameter with fixed value , but instead try something like Monte Carlo Analysis to get a “probability” of all cases . The other thing which can be done is project the future just like that and then do an yearly review to make sure you are on track and incorporate any changes if required . What do you say ? I do not know what the Monte Carlo analysis is but I am not saying we should not project the future. I think we should lower our expectation and do not get carried away. I’ll like people to have a target and then review yearly and adjust their plan as per the situation. Just wanted to share my plan. In 2000 I switched to IT from Manufacturing. I was apprehensive about my ability to continue in IT. So I set a target of 50Lacs for me to become financially independent. However, now I have revised that target many times to that amount. Two reasons , one inflation has pushed cost of living and second life style increase. In 2000 we were happy to buy a small car. But today I’ll aspire to buy a car of 12-15 lacs minimum. Thus I need much more before I can attain my financial freedom. Yes , I think adjusting your plans and target amount each year after an review is a much better idea that just projecting some amount in future and be with it . After thirty years Annual Salary of Rs. 1 cr. will common for any citizens living in India. And Rs.3-4 Cr. for MBA/CA/MTECH aspires will get. India will grow till 2045-2050 coz of the young age popluation. (Only there should be right reforms and right + honest governace on both Public & Private ). We should ask our parents what they where earning some 30 years back you will be amazed that , there Monthly Salary / Income will be today’s your expenses of Sunday / Holiday if u go out with your family. How do you know that after 30 years 1 Crore will be a common salary in India. I do not know your age but I am 45. I have seen that between 2002- 2011 there is very little salary increase in US / Europe. Also the Rupee has remained steady against USD in the last 10 years. Thus if this trend continues ( which is likely as India is progressing faster than the West) Our salary and living standard will start reaching their level. If you talk of 1 crore that means 200,000 USD. Do you know how many people get that salary in the west today. Very few. In 2041 also very few people will get that kind of salary. This will create a backward pressure in India as well. I am not saying it cannot happen. It is just very less likely and thus we should plan based on conservative estimate and taper our expectation. Just look at the US stock index between 2000 – 2011 there has been no increase in S&P. NASDAQ is actually less than what it was in 2000. Japan’s Nikkei has now less than half of the highest figure achieved in the 1980s. Thus do not think that prices travel in only one direction. So have a balanced view and save accordingly. I see that in indian markets also . There was very less returns in indian indexes too from 1993 – 2003 , a 10 yr period . We got just 3% annual return . Which is not that encouraging . The same can happen in India too . indeed the discussion is getting more interesting and thought provoking!in west, though the indices did not perform well quite sometimes, i think, Warren Buffet made money for investors from the same markets over a period, and in india , also, i think, some equity mutual funds(of course ,in 1993, only a few finger tipped no. of mutual fund existed) have outperformed the indices by good margins over a period. and vice versa also! and there is gold, silver and real estate too for investment for better retirement! so finance planning for retirement and other goals calls for continuous monitoring , searching better avenues, and i think, sites like ‘jagoinvestor.com’ is great help. keep it up! As you said u are 45 years or so, what was your salary when u started sum 2 decades back , calculate now to get CAGR per year. You might get the answer what I am saying. In lull period in india 1998-2004 when it was so hard to get Jobs and Salary hike were not easy ,you might have seen the Real Estate market was also lull at that period. It only pick up from 2004-2005 when Job market started picking up and salary hike was common at an average of 20 % + , so look at property prices then from till now. That’s why I had said Real Estate is most directly linked to Job Market. And this job market is directly linked to GDP Growth of the country. India is growing country with very good young age population ( nuclear family style living is also adding to this growth) and tend to grow till another 25-30 years or so. Till this age of young population does not mature till then india will grow 7.5 % + on an average ups n down will be there but in the long term it will be avaraged out above 7.5 % +. in this way, every 20 yrs. it increases 10 times i.e. at @12% compounding rate! and not @6% or 8%, which we used to consider for such calculation. Nice a nice Data . Can you ask him how did he get the numbers or on what assumption ? I looks to me over-streched to me personally . But I agree with you that there are many new things added in our life these days which was not there earliar ! yes, first it seemed me too exagerated data, but when i recalled mentally my own case (i am now 63! ), i found them nearer to the fact. though he mentioned the inflation effect, but i thought that it is due to life style cost escalation plus inflation effect, whatsoever, it is! Check the charges of the plan , If its 50% , then yes they would take your 50% money in first year . Also note that above “plan” depends on external factors which might be beyond your control . Good fundamentals on retirement planning. I would say for a target of 25-20 years of time, one can easily invest 100% in equity diversified mutual funds via SIP way. As one progresses age, shift some amount to debt systematically for stability of fund. Avoid NPS at this stage, as it offers ONLY 50% equity exposure. So, it becomes like balanced fund; in fact less than that. (balanced mutual fund has a exposure of 65% equity). Also, the annuity from NPS is taxable. ULIP for such a long term can also be a good option but for those who can easily digest the initial charges and know when to make use of fund switching and top-ups. One can make tax-free corpus for retirement and use partial withdrawal for systematic mean of regular income. Retirement ULIP plans at this stage are simple NO. They’re more or less like your savings account or little more than that. But not anymore. The GUARANTEED set by IRDA forced fund manager to invest max. to debt funds and hence less returns. All the above options & planning need to be given review again once DTC comes into effect. yes as you said Equity has to form a major component for retirmenet . But regarding your comment on NPS , there are many people who are hell-bound on NOT INVESTING in Equity , as they are not risk takers . But if those people choose to invest in NPS saying “Its government backed” or something like that , I would say its better than investing Endowment and PPF . What do you say ? First of all, if the investor is afraid of equity mutual funds, it’s better for him to educate himself about inflation and power of compound interest. There is no other right alternate for proper financial planning and that too retirement planning. If the investor is willing to invest in NPS and that too with 50% equity exposure, it’s easy for him to understand equity diversified mutual funds. But I can bet that majority of investors are investing in it because of Govt. of India name and they’ve not fully understood the product. One can not survive financially for 25-30 years with just debt funds like PPF. After all, it’s not the question of food & clothes and other daily expenses in retirement life. Rising medical expenses, cost of electrical appliances (TV, Refrigerator, AC etc. ), home renovation, car etc. – the list is endless; these all are visible expenses. Secondly, just NPS is a Govt. scheme does not fit itself in portfolio. Taxable annuity, charges on every SIP transaction etc are some issues. And all above, I’ll monitor its returns for 3-5 years to qualify it as an investment product. Till now, it’s under-performer as compared to even balanced mutual funds. Interesting and thought provoking post. The solution is not simple. It can start with getting sensitised with the facts. One may live for more years in retirement, in isolation(not with family in this nuclear family age) with mounting medical expenses. In such case, the important question will be not whether cure is available but will it be affordable. As indicated, one’s health is of paramount importance for two reasons. First to enjoy the post retirment life, more importantly to be afloat after meeting post retirement medical expenses. Once this is understood, one can estimate the requirement and get ready for planning the same. This is to be reviewed on a regular basis for making necessary changes in light of any changes happened. As was highlighted in a previous article, one has to plan for children. However one has to give equal(if not more) consideration to oneself as this is the time one can shape things of his future by proper planning. Once this phase(employment phase) is passed, there will be very little leverage one can exercise. Good points from you . I agree that once the employment phase is passed , not much will be left for planning . Company Superannuation fund V/s PPF or NPS or VPF. What is effect of DTC, and what are all good investments to get DTC benefit? DTC effect is a seperate topic, its going into the details , the aim of this article is to make people aware about importance of retirement planning . There are articles on DTC and NPS on this blog . can you go through them and find your answers . Best way for saving retirement funds is to go for VOLUNTARY PROVIDENT FUNDS . This is an extra contribution to the PF account apart from the mandatory deduction from the salary. This gives huge amount at the time of retirement which is tax free . The thumb rule is that no amount should be withdrawn. VPF is one of the tools which can be used and yes in debt category of products, its a very good one , But one has to make sure that equity is a core component for retirement corpus else it would not be able to fight the inflation . What are your thoughts on this ? Even meeting medical expenses is going to be a very big challenge. You will know that there is a solution for your disease but that will be too costly to afford. Great article Manish … just in time when I have started thinking seriously abt my retirement corpus. You hv aptly pointed that healthcare cost will be chunkiest for young guns today when they retire. I would like to draw a parallel to current US conditions. The baby boomer generation is retiring and healthcare costs are highest of all times with no public healthcare solution. Its their biggest concern. India too is leading an insurance driven healthcare system (very nascent to western counterparts), with little or no interest in public system by govt. By the time we grow old, no matter what you do today healthcare cost will be highest to you. When I started thinking abt it, I strongly feel that the current insurance products in the market will not help you develop a corpus for your post 55 yr times. There are and will be so many fine prints that will incur more and more out-of-pocket expenses. I am too puzzling with one-shot solution to this, but sadly there isn’t one. At this stage building a separate corpus of equity-debt mix is a wise idea. And by the time one reaches 50, you will have a fair idea of insurance products and then you can channel this corpus into buying something that suite you and your then current health conditions. And lastly I agree with Manish that investing in your health at this stage will pay off later. Better quality of life brings in lifestyle diseases like diabetes, obesity and heart conditions. And sadly they have recurring cost till you die. I thought Majority of US population is covered by health insurance ? Is it not correct ? Not even 50% is it ? Also as you pointed out the straight forward solution for good retirement planning seems to be to start as early as possible . In US, the medicare (federal) and medicaid (state) sponsored insurance systems work for 65+ … but for that you would have paid all your working years and the nation working class pays it today. More over its in top three of US govt expenditure and gets questioned in tough times. However they are still limited in coverage and often people have to take secondary insurance (which costs arms and length at their age). We don’t expect that system to get in India, primarily bcoz we cannot afford it and there is no proper citizen database to provide benefit (UID has still to prove its worth). US based insurance companies who are mostly running the insurance show in India thru JVs are trying to develop the same ecosystem which will increase the overall healthcare cost. Thanks for giving a good overview of health care situaiton in US and how its taking shape in India in coming days .